We have lots of characters in stock, so please call or email us for pictures. Character Assistant will set up music. Parent to introduce birthday child to Character Assistant. Character Entrance to Theme Song. Character will Meet & Greet (hugs, high fives, handshakes, etc). Character Assistant will lead character to greet the birthday child and take a photo. Character Assistant will pose character for photos while greeting party guests. 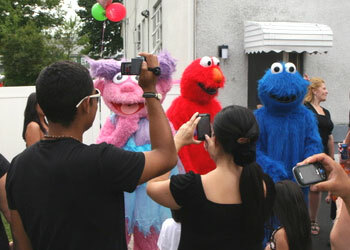 Character will dance with birthday child and guests (Music and Dance Along). Costume character and photo guests need ample space to move around the table as costume characters have limited sight. Parents lead the Happy Birthday song as the character gestures celebratory motions. The costume character theme song is played. The character hugs birthday child. The costume character waves goodby to everyone and exits.